I was excited to hear about the Guild's Challenge Yourself Challenge for March using Mona Luna's Meadow Collection (thanks again to Jennifer Moore for the fabric and Lisa Taglia for hooking us up). The simple rule of using this lovely fabric to try a new technique or project on my quilting bucket list has my mind reeling. I thought a quick blog post on the matter might 1) help me focus, and 2) generate some discussion on what others are thinking (or have tried). 1) Lone Star-- Having spent the better part of 7 years living in Houston, I admire this large and in charge star pattern which leaves no room or no need for anything else on the quilt. It seems like a great pattern to feature modern fabrics and color combinations. I've only tried piecing diagonals once and I gave up pretty quickly because I couldn't get my seams to match up just right and didn't have the time to learn for that particular project. There are some good tutorials out there, which have me thinking it might be worth trying for the challenge. 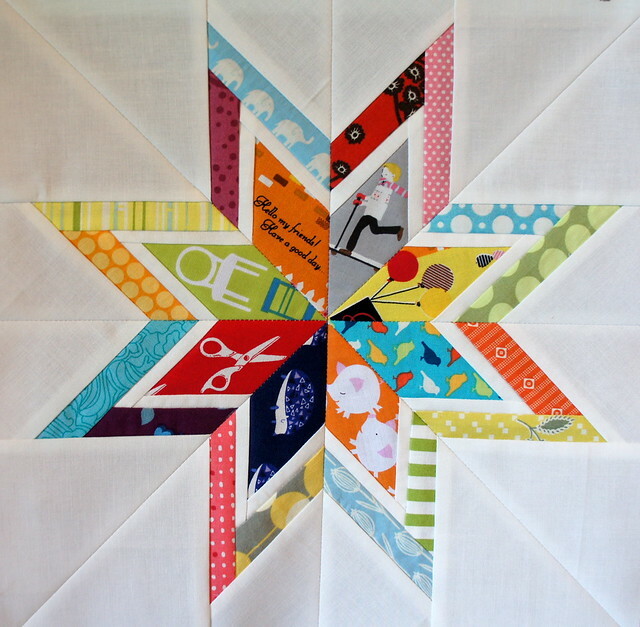 The Hopeful Homemaker has a great tutorial for a small-ish strip-pieced star that could be a good size to start with. Craftsy has a free pattern for the Lone Starburst, a paper pieced variation of the Lone Star. The pattern notes the level of difficulty as "beginner", so this might be a good option for anyone who wants to try paper piecing and avoid the challenge of matching seams on a 45 degree angle for a true lone star. swap a few years ago and would like to try again. 2) Cathedral Window--I missed the block lotto we did for this a few months back, but have always thought this traditional pattern looks particularly modern. I did make a CW pillow a few years ago for a Flickr swap (with a lot of help from a friend) and loved how it turned out. I've always wanted to give it another try, but haven't gotten around to it yet. I think the Mona Luna fabrics would look great with this pattern. 3) Single Girl--Love, love, love this Denyse Schmidt pattern, but have never tried curved piecing. It seems exactly like the type of thing I should be trying for the challenge. The Single Girl Quilt Along Flickr page has instructions and discussion threads that make this seem doable (though possibly tedious). 4) Paper/Foundation Piecing-- Our own MissEnota's work and blog post on Foundation Piecing inspired me to try this for my state fair quilt on a stick. I could see getting addicted to this with the many patterns available and the intricate designs that are possible using this technique. Kristin's blog post is really thorough and has links to resources and inspiring examples if anyone else is thinking of giving it a go. Specifically Kristin's cow is on my bucket list--maybe not quite right for these fabrics but I definitely have to make it someday. 5) Isosceles Triangles--I won a triangle template from a two-bit-bag drawing and haven't had a chance to try it yet (I also have no idea to use it, but it sounded like others in the MMQG do). 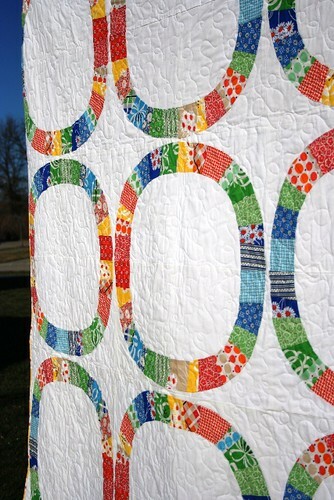 Rebel Amish by Adrianne of Little Bluebell is one of my all-time favorite quilts. Its Amish minimalism is another kind of quilt on my list (if that is a kind of quilt), but I was really trying to keep this list to 5 so will leave it at that! What are you all thinking for the challenge? What have you been itching to try? Do any of you have experience with these techniques? 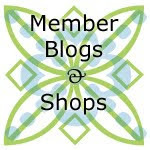 Tips, horror stories, wisdom to share? I'm trying to get an early start because I'm challenging myself to actually make one of our MMQG deadlines, which is challenge enough for me! They all sound great! Good luck deciding... I've always wanted to make an all-organic quilt. We'll see what happens. Great ideas! That pillow looks awesome with the covered buttons. 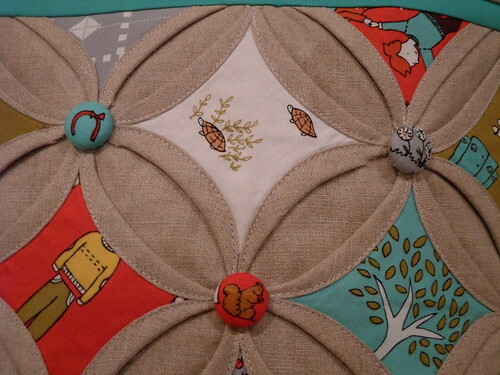 I am thinking of trying needle-turn appliqué which I have only done once before and am afraid of. Thanks for sharing! The buttons were really fun to make and really rewarding. I've always wanted to try hand turned appliqué also. Let me know how it goes! Love all of your ideas! I am thinking of something involving applique, because it's waaayy outside my comfort zone. Everything on your list is on mine now!